Have you heard of the mother of all subscription boxes, the Bar-Maids House Special? A quarterly subscription box, each with a unique theme. The first, was Outlander and if you didn't claim yours, you missed out. It completely sold out! But now is your window of opportunity to snag the second quarter limited edition, Knitmore Girls themed box. The Knitmore Girls House Special not only rewards you with a subscription to happiness, it also admits you to an exclusive club of Bar-Maids fanatics who will receive things chosen by Gigi and Jasmin. Unreleased to the public, you just might have to keep it under lock and key! The window to reserve your box closes April 3rd. Don't wait, order now as quantities are limited which means when it's gone, it's gone. Jasmin has been working on Barberry Cardigan (for Genevieve) out of Abstract Fiber Calder (in the "Saffron" colorway). #matchymatchyKAL #projectsweaterchest, since she got more yarn from Abstract Fiber. Gigi has an FO, she knitted Genevieve's tube socks, in "Je suis prest", from Gingertwist Studio in Edinburgh, with a black cuff and toe, reminiscent of the Blackwatch tartan, for Genevieve's #operationsockdrawer #kiltmenow. Maria is working on the Chevron Baby Blanket from the PurlBee.com in Cascade 220 superwash sport, held double. Maria has FOs, the Habitat hat out of On The Round handspun on Etsy, and the Vermonter hat, out of Dragonfly Fibers Supertraveller in Starry Night. She mentions the pompoms by Bernat. Gigi has been default knitting preemie hats out of leftover yarn, inspired by Jared Flood's Turn A Square hat. Jasmin needs to figure out what to do so a zipper will look good on the Barberry Cardigan. She picked up her Calligraphy cardigan in the meantime. Maria is wearing her Larch cardigan, her Happy Street, and her Libration cowl. We talk about lining hats and mention that the cashmere ladies are going to be at Stitches. Jasmin has been wearing her Seneca sweater. Genevieve has been wearing her Squirrel cardigan and her Duck Sweater. Maria also will be at Stitches West, say hi! to her and ask her for a button! Dizzy Blonde Yarn in Martha in green tones. Regia 6-ply, Lollipop Yarns in the Beefcake base and Berry Colorful Yarnings has a substantial base, and Opal also comes in a heavier weight. This week we talk about how to pack knitting for attending a fiber festival. 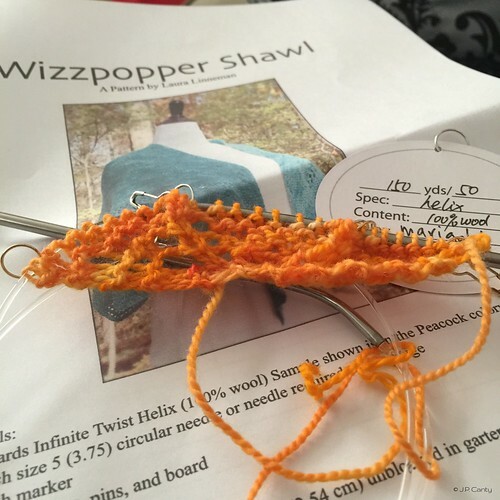 Gigi had started the Trouvaille kit, by Leslie Thompson from the Knit Girllls podcast, but blew past the point where she needed to do increases. Frogged back. Jasmin had intended to work on the SPAKAL cardigan, which was AWOL. She couldn't find it. She needs some yarn wound before she could knit more. Gigi couldn't get gauge when she was swatching for the 1000 Tulips from the Strick Mich! Club. Gigi has been having issues with the drive band on her wheel. Jasmin talks about using the surgeons' knot to fix the drive band. Gigi mentions the call for hand spun for the Abraham's Tent project. Gigi finished the Frozen III night gown, Butterick Patterns B4910 in the Olaf print. She cut yet another night gown and pajama pants out of some fabric with monkeys that Jasmin had. She enjoyed stay stitching all the curved seams. Jasmin repaired Genevieve's Elsa dress on her Featherweight. You've both talked briefly about fleece-lined hats in recent episodes. I just wanted to mention that from the time they were little my kids got itchy and twitchy if wool was anywhere nearby. All hats I made them were fleece lined. We do live in a four season climate, so warm hats come in handy but it's not THAT cold in our climate. The fleece, in this case, was just to keep their little noggins from feeling the itch by inserting a thin layer of fleece cut in the shape of the hat with two simple darts to match the contours of the head. They are just hand stitched around the bottom of the hat. I love your podcast, the interaction between you and your Mom is fantastic and so much great info. I was wondering about the disc shown in the above photo, what is it and where can I get some?